Red is a color of passion, romance, vigor as well as excellence. For many years this color has been relegated to the background as to the decoration of homes for very specific objects. It’s known as the colour of excitement, enthusiasm and joy. This color gives vitality and strength to the home, so we should take advantage of all its features and include Red interior design in our home. For decorations Feng Shui is a tone that is used to enhance the positive energies, in fact more and more people dare to decorate their houses with Red interior design like sofas, walls, ceilings etc. to give modish touch. For decoration anything can go red to make your home look zealous. Red is one of the most frequently used colours in the interior decoration of the house, especially in the decoration of family rooms.You can show the timidly appearance with more muted colours in the range of red, but the hot red is undoubtedly looks the most conspicuous, if one or two walls are highlighted with this colour to fill it with optimism space.You can also paint some cross beams on the ceiling or walls with this colour to get an insurmountable effect without too great efforts. Red interior design can also carry to the kitchen, paint the cabinet doors, countertops, appliances doors, etc. There are endless possibilities and the only limit is your imagination. Dare to incorporate Red interior design in different rooms of your house and you certainly will not regret it. Red furnishings combined with black and white tones convert the living room to modern, full of personality. The most striking place to apply Red interior design can be the lounge. A red couch with white walls and other accessories in black will help you achieve a contemporary and delicate appearance.Use a table or floor lamp with silver or gold base as golden or silver depicts a modish, stylish look. For bedrooms, fabrics, rugs and decorative accessories can become the perfect items decorating in Red interior design. But remember, in bedrooms (the places of relaxation), red could be a source of stress if you put in much of the space, you can use for cloth materials like duvet covers, sceneries or other decorative accessories. Use a red vase with fresh flowers, this would provide your room freshness and an elegant living look. Kitchens can be the perfect place to use the most of the Red interior design. The kitchen furniture or cabinets in cherry red shades combined with a glossy black colour can have a dramatic result and achieve a look for your kitchen that you use to see in magazines. There is nothing better to complement the decor with red furniture, which is used to provide better artistic style. You can use a vintage coffee table with a solid red wood to position in front of sofa; also accessorize with a chair or couch in red touch. You can enhance the elegance of the room using red fabric materials, like can use a wool red cloth on the back of a white, bronze, black or brown sofa. Use wood or tiles in warm colours to the peak, can also complemented it with a red carpet. Give a better way using colourful cushions on the couch.Use candle holders on the wall in gold or silver. Hang a piece of art or a family photo with a bright silver or gold frame. In the same way you can also decorate bathrooms giving Red interior design either to accessories like wash sinks, toilets or shower tubs; also can paint walls. You can use red towels only if the walls are white or some other tone. 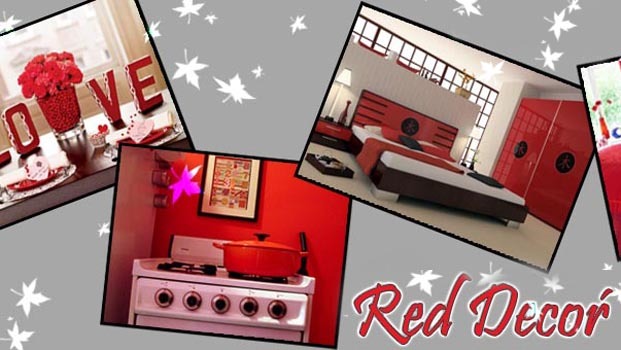 There are many ways to apply a Red interior design to give a modern look to home; share with us which you like best.